What’s your inspiration? It’s the beach for me! What makes your craft juices flow? A strange week or so. Still hospital visiting, still a sad time within my family. However, when we get a chance we take a break and try and do something good for the soul, which means to me a visit somewhere special or a little crafting time. Recently there’s been a trip to Whitstable, one of my favorite places to visit. I have mentioned this lovely coastal town on my blog before. It is somewhere I gravitate towards and it’s just over an hour’s drive from where I live. We usually park at Tankerton Slopes and walk along the prom towards Whitstable itself. A stroll admiring the beach huts is wonderful. If it’s breezy then troubles seem to be blown away, if it’s sunny then the warmth eases all the stresses within your bones. Either way I love it there! More huts on The Slopes. The same day, different skies! There’s always been something special about beach huts for me. Someone has been very clever in a Whitstable pub garden. The Smack Inn reveals the delights of beach huts as a seating area, with a BBQ area and there was a list of gigs coming up too. We snatched a quick beer before we had to head back but it won’t be the last time we visit. I have added to my beach themed fabric recently too, which I guess is inspired by this visit and I feel a bag coming on. No photo to share – but there will be! It’s a friend’s birthday very soon too. She has been admiring this fabric in a local shop. At first we both thought of ‘a swingy 50’s skirt’! But it’s a fairly thick linen/upholstery weight and neither she or I are wearers of those anyway! With a limit on crafting time and knowing she loves stationary … Ta – da – I made a book sleeve and I hope she’ll love it! My fabulous sis in law gave me a Kaffe Fassett fabric book sleeve as a gift a while ago, it makes my notebook feel special, not just a book stuffed in my bag to be dragged out for notes and queries! I am hoping my friend has the same delights when she uses it. Not much else to show for the last few days. I have a lot in my head (cotton wool my husband says sometimes!) , lots of craft projects amongst it, but life is getting in the way right now. I have knitted a few rows here and there, sewn a little too, messed up a couple of ongoing projects, ripped back and unpicked. There will be more to show off soon. 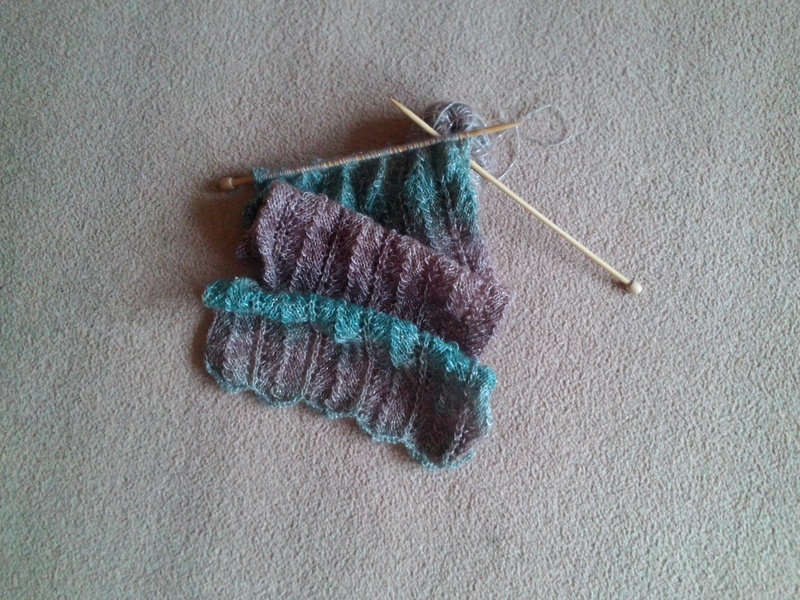 This entry was posted in Uncategorized and tagged beach, craft, knit, sew, tankerton, Whitstable. New job/old job! Sew impossible today! I have a new job. I start tomorrow. Well, it is a new job, but it’s kind of an old job too. I am returning to a Company I left more than five years ago, with a little more responsibility this time and perhaps a slightly different mindset. I am somewhat reassured I know what I’ve let myself in for, however I am also full of trepidation and cannot settle to anything today. If a friend asked me whether they should return to a job they left I would probably say ‘don’t go back/move forwards’ for a whole host of reasons, especially if they left through choice, as I did. I have mulled over this very thing. Circumstances have changed slightly, location of job for one. The Company is moving forwards itself too. I am hoping there is a mixture of knowing what I am doing, plus a few new challenges and new faces. I am so lucky to be given this opportunity. However, I had kind of gotten used to not working! I’ve been crafting more and loving it. The job is only part time so I shall still sew and I shall still knit, perhaps not quite as manically, but hopefully as productively. Today, however, it just isn’t happening – I have picked up my sewing and held it for ages without stitching a stitch. I have rummaged in the knitting bag next to my seat yet not been tempted to pick up sticks and actually knit. This feeling of being unsettled is just a temporary blip – I hope! So, a few of pics of a recent trip to Devon, instead of the usual crafty updates in bulk! This part of the UK truly is a wonderful place. Unfortunately for us, the drive there took 8 hours rather than 5, less said about that traumatic part of the trip the better ! Goodbye for now, back another day! Two weekends ago, hubby and I posing in the sunshine at Salcombe. Lovely place to visit ! The view from where we stayed in Bigbury on Sea, across to Bantham Beach. Glorius! We walked across the sand to Burgh Island, took refreshments in the Pilchard Inn, thinking of the smugglers who frequented many moons ago! You have to time your return if you want to walk back – if you miss the tide then there’s a sea tractor as otherwise you’d have to swim or wade ! This entry was posted in Uncategorized and tagged bigbury on sea, burgh island, craft, devon, knit, sew, stitching.